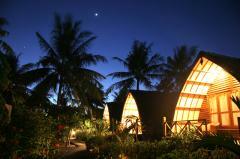 Manta Bungalows are beautiful traditional rooms with AC, hot water, mini bar, and safety deposit box. This is classed as mid-range, whereas Gili Villas are located a few hundred meters from the dive shop and offer a more luxurious option, particularly popular with groups and families. 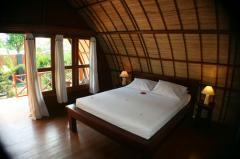 The bungalows are based on a traditional rice barn, with a high roof and generous balcony where you can enjoy the sunset. The natural building materials used are finished to western standards with A/C, mini-bar, safety deposit box and luxurious bedding. The contempary Asian fusion is completed by the elegant outdoor bathroom. Our bungalows represent not only great value for excellent lodgings but also possibly the shortest stagger from bed to dive boat conceivable. It’s just a short commute of about 60 meters from crisp white bed linen to clear blue water via the inclusive breakfast. also provide for many inactivities such as our on-site masseur, relaxing in our hammocks, by the pool or chilling in one of our berugaks, while sampling our local and western food. Family with child under 12 years old sharing the same room with parents is free of charge. Confirmation of each room is subject to room availability and "first come first served" basis. After making a deposit/payment in full with us your booking is secured. 2 weeks prior to reservation date, no refund. Please see your attached invoice. I have provided the details of our Rp account and USD account, as well as the total to be transferred less your commission. The invoice is due on 30th August 2010. Please email us regarding the IDR rate and the total to be transferred.